Research grants support original, scholarly research that advance the knowledge base and practices within the field of collegiate recreation. Grant award amounts will be based on the needs of individual projects. The NIRSA 2019 Research Grant Application Guidelines are now available! If you have any questions, please contact Ruben Guzman, NIRSA Research Coordinator. 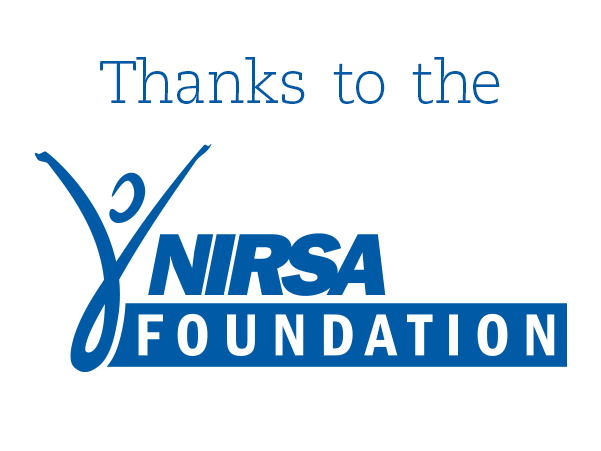 The NIRSA Foundation proudly supports the NIRSA Research Grant Program. The NIRSA 2018 Research Grant Application Guidelines are now available! Please use the available rubric to evaluate your proposal before submission. If you have any questions, please contact Ruben Guzman, NIRSA Research Coordinator. All funded research projects must be conducted either at or for NIRSA member institutions. Applications from students must be supported by faculty or staff sponsors who have agreed to oversee the proposed research. Applicants do not need to be NIRSA members. Collaborative, multi-institutional projects and those involving historically underrepresented groups will be given special consideration. Proposals should focus on the priorities identified in the NIRSA Research Agenda. Please refer to the Research Grant Application Guidelines prior to preparing a proposal. To apply for one of these prestigious grants, or for further information about the NIRSA Research Grant Program, please contact nirsa.research@nirsa.org. The 2016 grant application period has closed. Please check back soon for the 2017 application cycle. Clearly articulate a strong research design. Qualitative, quantitative, and mixed-method studies will be considered. Methodology must be appropriate for the research question(s). Be completed by October 2018. Results must be ready for presentation at the 2019 NIRSA Annual Conference and be submitted for consideration for publication in a peer-reviewed journal, such as NIRSA’s Recreational Sports Journal (RSJ). Explore unique issues, subjects, analysis, participants and/or sample. Research must be original work of the investigators and may not have been reported elsewhere. Have potential to have a broad impact on campus recreation initiatives.